About the bike trail between Dabki and Dabkowice Poland. Includes a video. The bike ride takes you Dabki, Poland to the tiny, remote village of Dabkowice. To get yourself oriented, look at the pages about Dabki and Dabkowice. 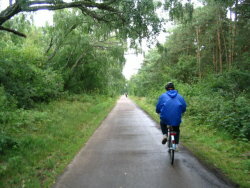 You ride along a very narrow piece of land that separates the Baltic Sea from Lake Bukowo. Except for Dabkowice, the land is unpopulated. The beaches on the Baltic are beautiful. And the fishing in Lake Bukowo is great. The ride is absolutely beautiful. The ride is about 7 kilometers long. There are many places you can stop and picnic on the beach. And there are many places you can stop and fish on Lake Bukowo. The beach front is essentially barren of people. You can get all the privacy that you want there. You will essentially be in the middle of nowhere. You can choose to ride the road between the two places or you can ride part way on a dirt path. The path is very easy to navigate. And it is really rather fun to ride. The video has some views of what it is like to be on the path. As a side note, the dirt path is never far from the dirt road. If you look at the map below you will see why. It can't be. The land mass is too narrow. Traffic on the road is easily handled. The speed limit is 20 kph. Most people ignore that, but they don't go much faster. The road is simply too narrow and they take it easy. To put things in perspective here is an image that shows the location of Dabki and Dabkowice. You can see the road that you can ride. And you can also ride on a dirt path part of the way. Here is a video that will give you a feel for the experience of what it is like bicycling on the Baltic Sea Coast and specifically taking a bike ride to Dabkowice, Poland on the Baltic. 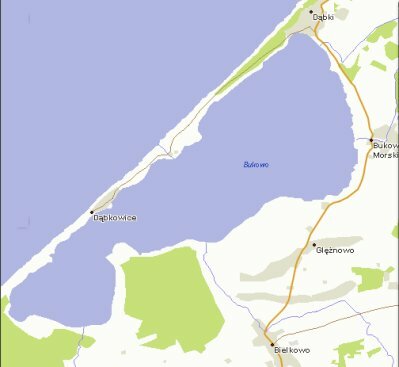 To bookmark of link to this page, use Bike Ride To Dabkowice Poland On The Baltic.